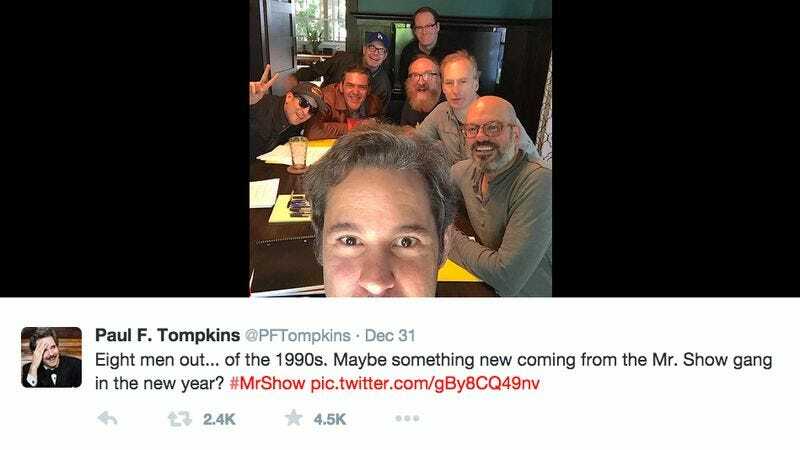 On New Year’s Eve, Paul F. Tompkins tweeted a photo of himself along with a good chunk of the Mr. Show creative braintrust, teasing us nerds with the message, “Maybe something new coming from the Mr. Show gang in the new year?” He even hash-tagged it #MrShow! Well, as astute A.V. Club readers already know, Mr. Show princi-pals David Cross and Bob Odenkirk have talked up the idea of a big tour for 2015, to celebrate the 20th anniversary of the greatest sketch show of all time. It looks like that idea is unlikely at this point, though, with Odenkirk committed to Better Call Saul and Cross getting ready to do another season of The Increasingly Poor Decisions Of Todd Margaret. So just what are these people doing together, and why is Tompkins teasing us? Turns out they don’t exactly know themselves—we e-mailed Cross, who said, “Well I suppose you could say we were all meeting in anticipation of being able to do (something?) to mark the twentieth anniversary of Mr. Show? I suppose that works. It was the first time we’ve all been together in a room since the audio record for Hollywood Said No and it was a blast.” So there you have it. Here’s some speculation instead: A big, one-off live performance which will be filmed for HBO. Pictured below and above, clockwise from bottom: Paul F. Tompkins, Scott Aukerman, Jay Johnston, Eric Hoffman, Bill Odenkirk, Brian Posehn, Bob Odenkirk, David Cross.